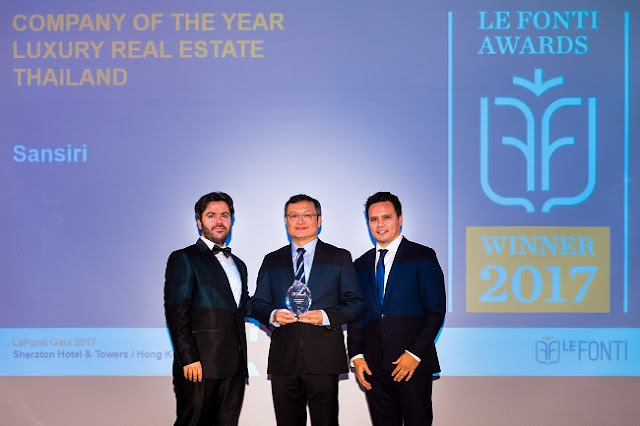 Hong Kong, 12th April 2017 – Sansiri Public Company Limited, Thailand’s only fully-integrated property developer, was honoured with two prestigious awards in two categories - “Company of The Year - Luxury Real Estate Thailand” and “CEO of the Year in Property and Real Estate in Thailand”, at the glittering Le Fonti IAIR Awards 2017 presentation ceremony at Sheraton Hotel & Tower in Hong Kong recently. The awards were accepted by Sansiri Plc.’s Senior Executive Vice President for Business Development (Condominium), Mr. Uthai Uthaisangsuk (right photo : centre), alongside Head of International Business, Mr. Cobby Leathers (right photo : right). Sansiri was the only Thai developer to have received these Le Font IAIR awards in the Real Estate sector, as a clear testimony of the vision and leadership leading Sansiri towards new growth, from being a top property developers with 32 years’ experience to a company that delivers a wide range of projects using the most modern design methodologies. A fine example is "98 Wireless", one of Southeast Asia’s most stunning residential developments in its magnificence and elegance. “98 Wireless” has become the region's most exclusive residence fashioned with quality materials to evoke a combination of modern elegance, aristocratic design and pure luxury. “Le Fonti IAIR Awards” is a leading ranking systems and hosts award ceremonies in Excellence in Innovation & Leadership. It is made up of a committee of Le Fonti IAIR and IAIR REVIEW.org and a team of dedicated legal, economic and financial journalists in over 120 countries. Sansiri is regarded as Thailand’s leading developer of quality homes, townhouses and condominiums, and the country’s only fully integrated property developer. 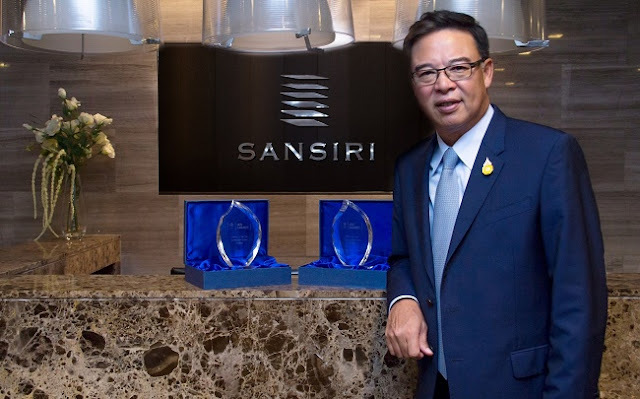 With a 3,400-employee workforce, Sansiri has built more than 300 projects throughout Thailand and a residential building in London during its 32-year history, with a strong emphasis on design and livability. Sansiri provides comprehensive services that go beyond those of traditional developers: Concierge services, property management, sales brokerage, and long-term resort rentals. In 2015, the company’s revenues totaled more than USD1 billion.